Across species, mothers play an incredible role in the development of the young. 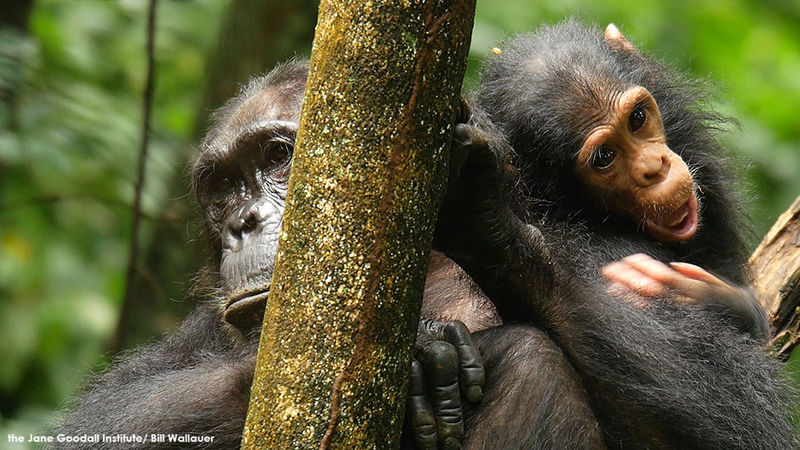 In chimpanzee communities, mothers display care, support and other behaviors in a variety of ways. 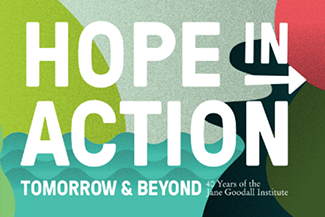 Dr. Jane Goodall has been fascinated by the relationship between a chimpanzee mother and her offspring for nearly 60 years since her initial research in Gombe, Tanzania, began. The birth of infant chimpanzee Flint in the early 1960s by mother Flo began the first study of the relationship between mother and infant by Jane. 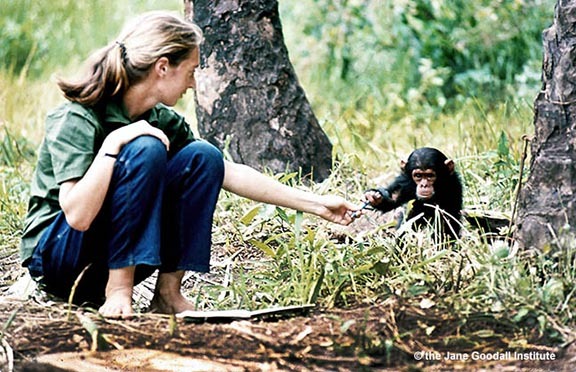 Jane has reflected that her observations of the chimpanzees helped her become a better mother to her own son, Grub, and helped her better understand the instincts of chimpanzee mothers! Her ongoing study, and the subsequent research on chimpanzee mothers have demonstrated the affectionate bond that chimpanzees share. Fifi was one of the chimps living in Gombe when Jane first arrived there with her own mother, Vanne, in 1960. She was an excellent mother of seven offspring, demonstrating great care and patience for each of her children. 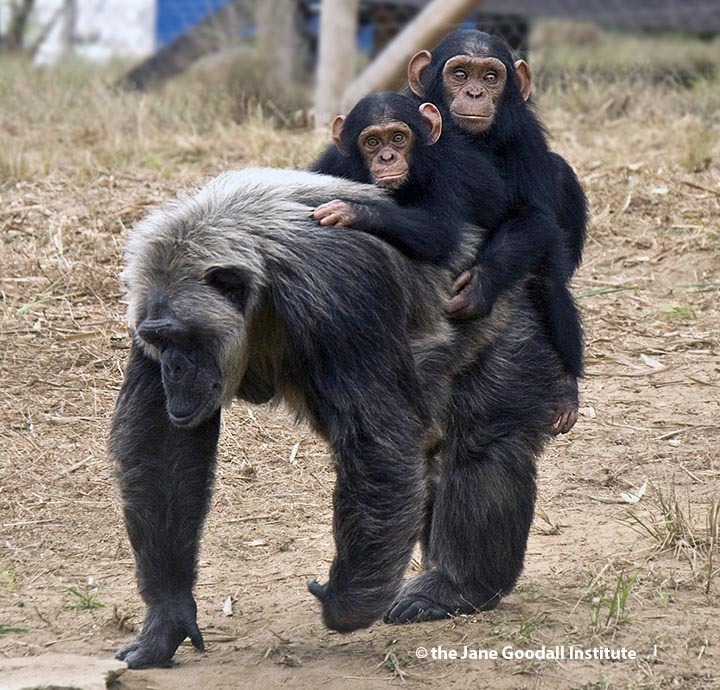 Young chimps will ride on their mothers’ backs for as long as they can get away with it, and with Fifi, that was a long time. Faustino, Fifi’s first child, was still riding on her back when her next son Ferdin and was born. Jane has long been grateful that she was able to study Fifi’s relationship with her children so closely. Her legacy of being an affectionate and loving mother will live on forever, especially in the current research on the ‘F’ family lineage which continues to this day. Another extraordinary chimpanzee mother Jane was lucky enough to meet was La Vieille. Her origin story is unknown, but she likely lost her mother to the illegal bushmeat trade and was relocated to the Pointe Noire Zoo in the Republic of the Congo as an orphan in the late 1980s. La Vieille and the other chimpanzees at the zoo were without water, starving, and living in terrible conditions. Upon her rescue and relocation to JGI’s Tchimpounga sanctuary, she was so easily frightened that she did not leave her enclosure for the first two years she lived there. Eventually, with the support of the Tchimpounga caregivers, she had the courage to explore and La Vieille moved into an enclosure with infant chimps, where she became an amazing foster mother! One of La Vieille’s foster babies was Likuaka. He arrived at the sanctuary very young and upon inspection by Tchimpounga vets, they discovered he was infected with parasites. Once he recovered, La Vieille took him in as her own. She was very tolerant of his mischievous behavior and would allow him to cling to her while walking. 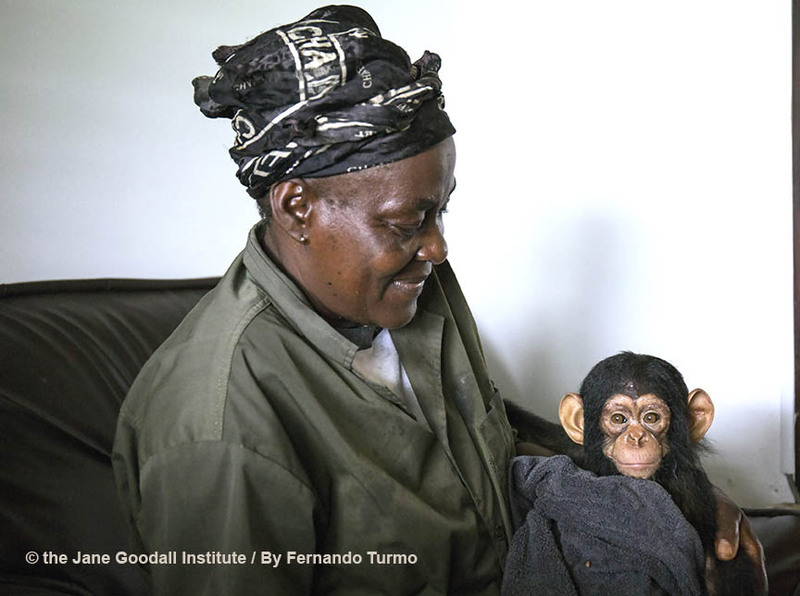 La Vieille meant the world to the team at Tchimpounga, Dr. Goodall, and her little adopted child, Likuaka. Sadly, La Vieille passed away in 2017, though her adoptive motherhood and compassion will live on as one of the most beautiful examples of how the instinct in chimpanzees to nurture and provide comfort to one another is incredibly strong. Humans can also play important roles as surrogate mothers for infant chimpanzees. Antonette, a JGI caretaker, is an adoptive mother to Vienna, one of the newest baby rescued chimpanzees at JGI’s Tchimpounga Chimpanzee Rehabilitation Center! Vienna is just over a year old and lost his mother likely by poachers as part of the illegal pet trade. Like other young chimpanzees, he still needs constant care and attention. They spend every moment together as Antonette heals his emotional scars. For Vienna, though nothing can replace the support and lessons of a chimpanzee mother in the wild, their bond is essential to Vienna’s development. New arrival at Tchimpounga, Vienna, and his adoptive mother JGI caregiver Antonette. As we have learned through Jane’s research and the ongoing discoveries at Gombe, chimpanzee mothers play an important part in the development of their young. Fifi, La Vieille, and Antonette show us how transformative love and support can be for a young chimp. To support these amazing moms, you can get your very own La Vieille art print by Becci Crowe from our eStore here, as well as our other mother-infant chimp art here. You can also help chimps like Vienna and the nearly 150 others at Tchimpounga Sanctuary by becoming a Chimpanzee Guardian! This program provides important resources to orphaned chimps and helps protect them from illegal hunting and trafficking. As a Chimpanzee Guardian, you can give them a second chance at a life filled with care and love. Previous ArticleChimps, Humans, and Monkeys: What’s the Difference? Next Article Get Your Chimpanzee Celebration On with Team Jane!